Over the past three days the media have been covering my story of winning the internship with Charlie Sheen and the eventual reality that the whole event was a carefully orchestrated stunt to better my chances of actually winning. I want to take a moment to discuss the media, how I managed to manipulate the system somewhat and document the level of thought that went into the planning of this audacious stunt. The planning for Tuesday’s claim began last week when I was brainstorming to come up with a way of creatively meeting the brief for round three of the competition. 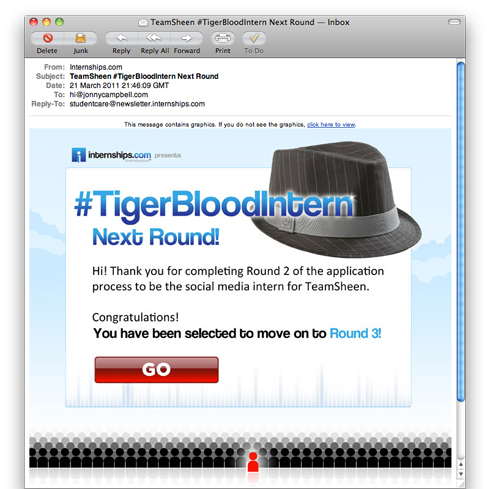 I deciphered from previous correspondence that internships.com seemed to contact successful candidates approximately seven days after a submission date. This would mean the successful applicants would most likely find out on Friday, April 1st. Within fifteen minutes of posting my winning status on Twitter I received a phone call from the press desk at UTV asking if I could confirm the story was true. At this point I had to maintain my position in order to see how much coverage I could get. 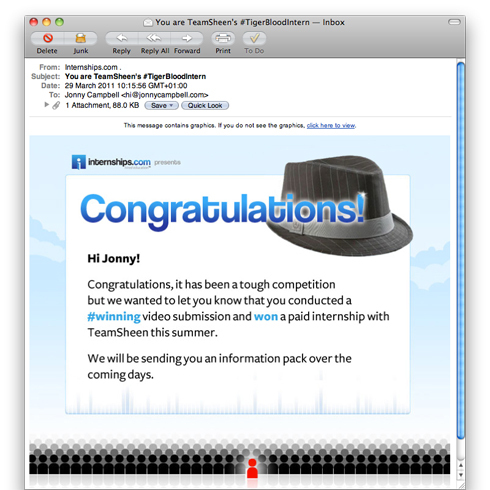 The research team asked me to forward them the email to confirm the validity of the story and so I passed on a screenshot of the photoshopped winning email. Over the course of the day the research team asked me to forward through other emails to confirm the story. As I had actually progressed to the final round of the competition this part was easy. Additionally, the research team contacted my lecturer, Christopher Murphy, to check the veracity of my story. I had every eventuality accounted for as I had carried out the work in the planning phases. The journalism on the media’s behalf was thorough and cannot be faulted. This was a believable story with enough evidence to quash any doubts which could have arisen. I have been documenting everything I possibly can over the past few days; newspapers, radio clips, TV footage and web articles. I am including what I have here to show the extent as to which the story was covered. All links are in mp3 format.